The League would like to congratulate the following HYFL member teams (highlighted in bold below) on reaching the finals of the Middlesex Football Association Youth Cup Competitions. A tremendous effort by all players, managers, coaches and parents/supporters. As a result, it has been decided that, subject to on-going favourable weather conditions, League Challenge Trophy competitions will be introduced at this stage at all age-groups. Matches will start as from Sunday 12th March 2017. The fully sanctioned draw is here..
As you will be aware, for some 20 years since the Combination was formed, member clubs have voted each year to agree to implement a substitution policy, such that two substitutes would be used in each match by each team; on a rolling basis at set times. This was a policy also operated by many development leagues around the country and was applauded by many coaches and parents alike as the right thing to do for these age-groups, to maximise football each week and to be equitable to those players as to the playing time they played; so that the emphasis was on enjoyment, team participation and the development of football skills and techniques. In recent years, the above policy has not been followed by all member teams (by the majority but not by an increasing minority), despite the agreement being re-confirmed on an annual basis. That has caused unnecessary disputes to arise between teams, which on occasions has resulted in unsatisfactory behaviour being noted. As you can imagine, it is also almost impossible for the Combination to enforce this policy agreement, where the application of any penalty would be almost meaningless and really just financial in nature – which does not serve the purpose of development football at all. Since the start of this season, we have been in liaison with The Football Association (at Wembley) who have been insightful and worked closely with us to seek a way forward. We have also consulted with a number of member clubs and other stakeholders on this as well. We have monitored the matter closely in match weeks 1 to 4 in Phase I and the position has not changed/improved. So - for the good of the players (our main priority), parents, coaches, clubs and the Combination (as one of the top-ten premier providers of youth football in England), we have decided to ‘rescind’ the above agreement with IMMEDIATE EFFECT. This decision has not been taken lightly as you can see above, and we would still promote the use of two substitutes in each match and at set times. However, if coaches and parents (and maybe ‘parent power’ prevails!) do not wish to do this then the following applies from hereon-in. Under 7 and Under 8 – 5 vs 5 football (no change); and up to 5 substitutes who can play on a rolling basis at any time. This means that you can now play between 5 (minimum) and 10 (maximum) players in a match at your discretion. Under 9 and Under 10 – 7 vs 7 football (no change) and up to 7 substitutes who can play on a rolling basis at any time. This means that you can now play between 7 (minimum) and 14 (maximum) players in a match at your discretion. nb – these numbers accord with the standard code of rules for youth leagues. -	‘All’ players who ‘play’ in the match ‘must’ be recorded on the on-line match result form. We hope that the above is clear and finds general favour with member clubs. If you have any questions or require clarification please email: harrowcombination@btinternet.com. 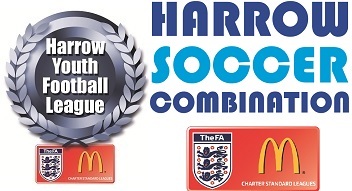 The Harrow Youth Football League (FA accredited Charter Standard League) have, today, released the final divisional (U/12 to U/18) composition for this coming 2016/2017 season – with a record 71 clubs and 319 teams; a 7% increase over last season. As you are aware, the League Management Committee fully discussed the running of additional League Trophy competitions back in January 2016 and set groupings for a number of teams in the League. This was reviewed again in February but, at that time, no additional Trophy competitions were set/added due to the remaining number of matches that each team had to play. However, as previously advised, this was reviewed again in March for a final time this season. As a result, it has been decided that, subject to on-going favourable weather conditions, further League Challenge Trophy competitions will be introduced at this final stage at certain age-groups. Matches will start as from Sunday 3rd April. The terms and conditions of playing are as set by the Management Committee, in accordance with Rules. Full details will be sent out shortly but, in summary, each team will play the other in their ‘Group’ (home or away at the sole discretion of the League Fixture Secretary) – with progression to the next knock-out rounds. These knock-out rounds will be played and extra time and penalties decide the winners (except in the final tie where no extra time will be played and penalties will decide the winners). If weather conditions deteriorate in the coming weeks then, under Rules, the League Management Committee reserve the right to cancel any of the competition age-groups or to withdraw any team or teams from the competition at its sole discretion. This decision, if taken, is final and binding. League and League Challenge Cup matches will always take precedence in this decision process.